The team at Vermilion Events did it again with their latest event. An annual event for 1200 people this group is young and high energy and although a corporate event this one likes to party. Choosing the best location was the first step. 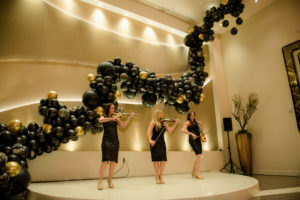 Utilizing the high glamour at the Chateau Luxe Event Venue in North Phoenix was the perfect start. This incredible location has Swarovski crystal chandeliers design by the same people who did the famous Chandelier Bar in Las Vegas. An expansive tiled foyer allowed our team to do an angled and 75 foot red carpet welcoming the guests. This red carpet was flanked with Hollywood walk of fame style star signs with past award winners. At the end of the red carpet and strategically placed behind registration was a 28 foot balloon sculpture that quickly became the photo op of the night. This eye popping piece was the perfect background for Urban Electra – an all female electric strings performance group. Through the large foyer for for the ballrooms we had furniture vignettes including 8′ black vinyl tufted chairs and other ornate pieces. A step and repeat and 2 other photo ops was also welcoming the guests. 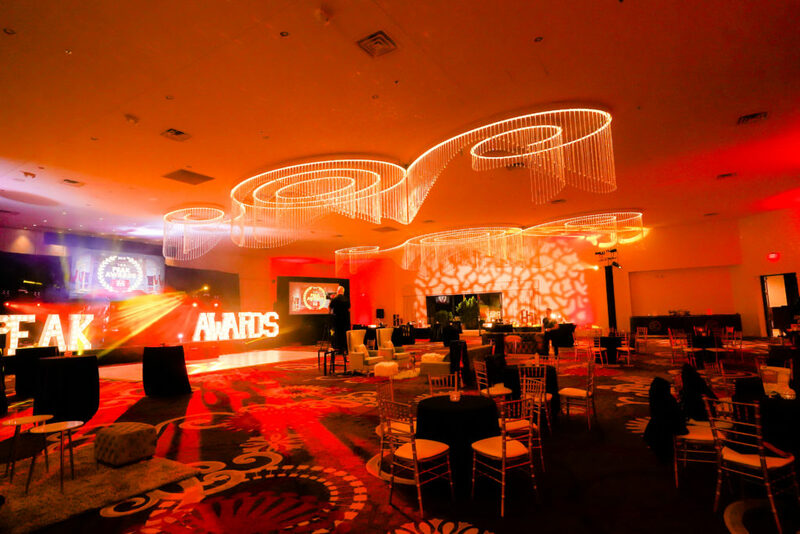 On the most prominent wall, we worked with a local lighting company and designed a Hollywood themed digital projection of all of this years award nominees. 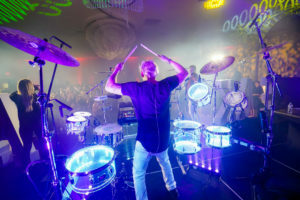 Once the awards were done we had our promo girls help with a grand reveal of Percussion DJ Ricky Rocks, flown in from Southern Cal to bring the house down and let the attendees party the night away. 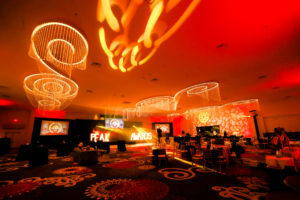 This event, proves that corporate events don’t have to be boring. 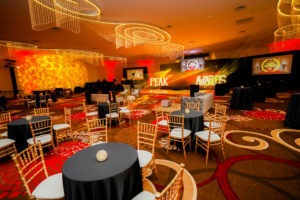 Listening to the clients wishes and working seamlessly with design and production you can create an ideal evening for all.